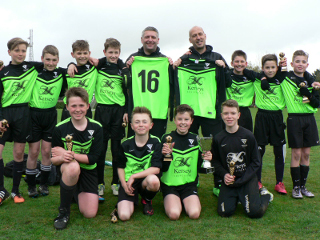 The Kerseys-sponsored Martlesham Youth Football Club (MYFC) Lightnings Under 12s has won the league again this year – scoring 100 goals throughout the season. The team, who have been supported by Kerseys Solicitors, fought off stiff competition to retain the South Suffolk Youth League title for their age group. The team played their final match away at Framlingham Town Youth Football Club, where they won 14 – 1. Kerseys, which is based in Ipswich and has an appointment office in Colchester, has provided kits for the youngsters. The firm is now set to sponsor another set of kits for the team and pass on the current kit to the younger MYFC teams, possibly to the U11’s Mustangs, who are captained by Justin’s youngest son, Jack. 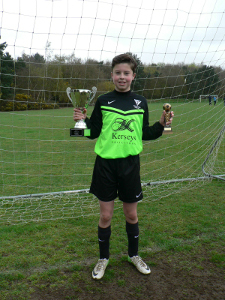 Justin’s eldest son, Owen, who is 12 and attends Kesgrave High School, scored seven out of the 14 goals in the final match. Owen was given the honour of collecting the trophy this season. Justin said: “Of course, I’m very proud of my son, and of the very strong team performance which enabled them to win the title again. The team played 20 games — winning 16, drawing one and losing three. They scored a total of 100 goals, whilst only conceding 24. Manager and MYFC Chairman Steve Whelan said: “We’re delighted to have won the league again. “We’re very proud of the team for all the commitment and dedication they have shown in training. Their hard work has paid off and they are becoming increasingly skilled footballers. MYFC has at least one team in every age group from U6s to U18s and they are traditionally named after planes which the RAF used to fly from Martlesham.